It's fitting that today is Valentine's Day because I'm sharing all about how to create a small craft space that you LOVE! Decorating a craft space should be a fun experience, all about you. 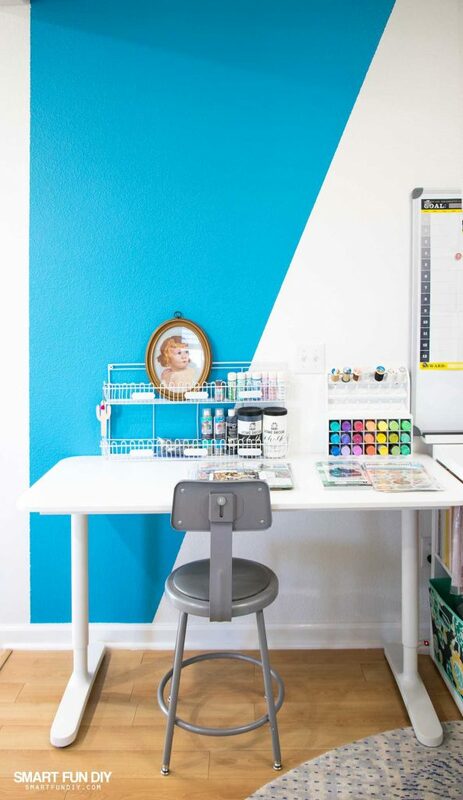 It's easy to get caught up in all the picture-perfect craft rooms on Pinterest and Insta. I always come back to creating a space for ME. You gotta create a space for you! And it doesn't have to be a budget-buster. 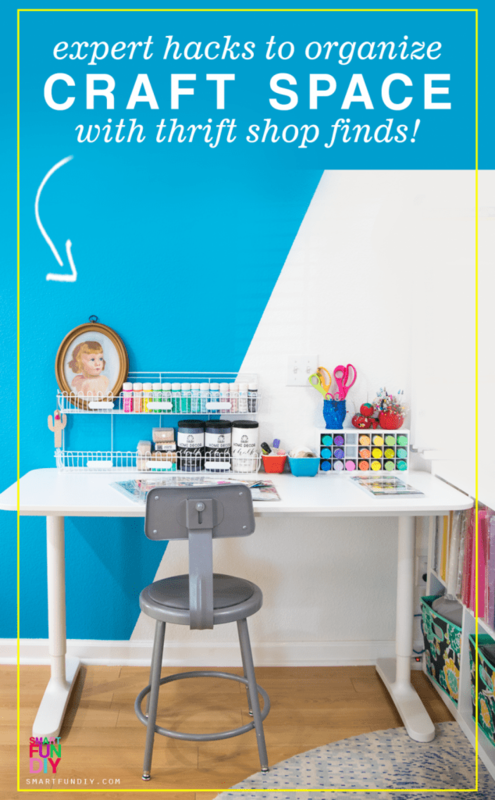 Today I'm sharing my tips for how to decorate a small craft space on a budget … a space that supports the way YOU create! In the tour, I share about how I down-sized my craft stash and set about creating a space that I not only LOVE but a space that was designed for me alone, designed to support how I create and designed just to make me happy. It's so so easy to get caught up in what we think a craft room should look like that we can sometimes lose ourselves in the process. That's totally what happened to me prior to 2017 … I was designing my craft space to reflect what I thought other people would LOVE, in a way that I thought would get me attention, and in a way that I thought we were supposed to do it. Yes, I am 100% keeping it real with you and admitting my shallow motivations! In 2013 I went through a radical change in how I thought about my supplies, how I organized my space, and how crafting fit into my life. I had an epiphany. I realized my craft room didn't make me happy because it was not MINE. It was designed with other people in mind. Once I realized that issue, I set about changing it. Today I am going to share my hacks and tips for creating a craft space you love on a budget. Yup, we're gonna talk about the thrift shop, ways to get deals on furniture, and how to decorate your space for you and you alone. But first, I want to share a very special guide I created just for you!! 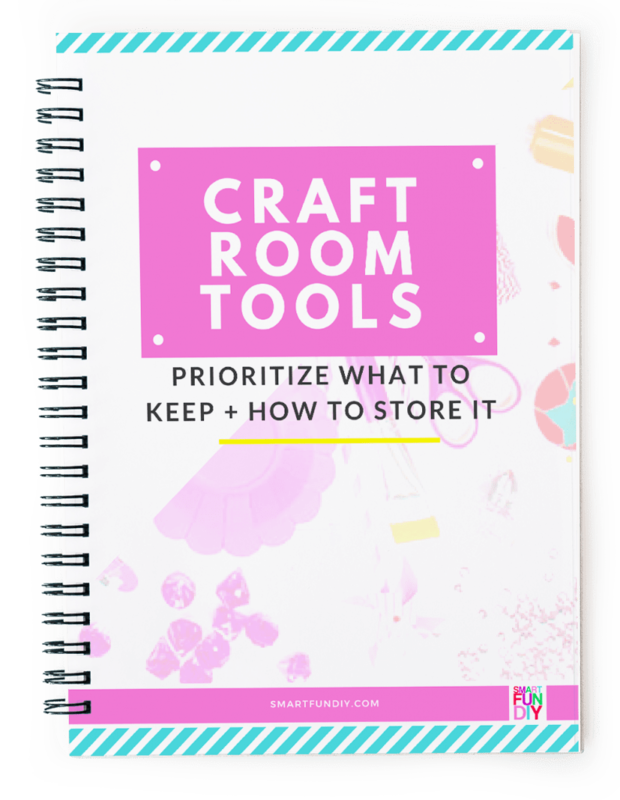 It's a Craft Room Tools Guide that you can use to organize your tools to make them easier to use in your space. Click the button below to grab the FREE download right now! 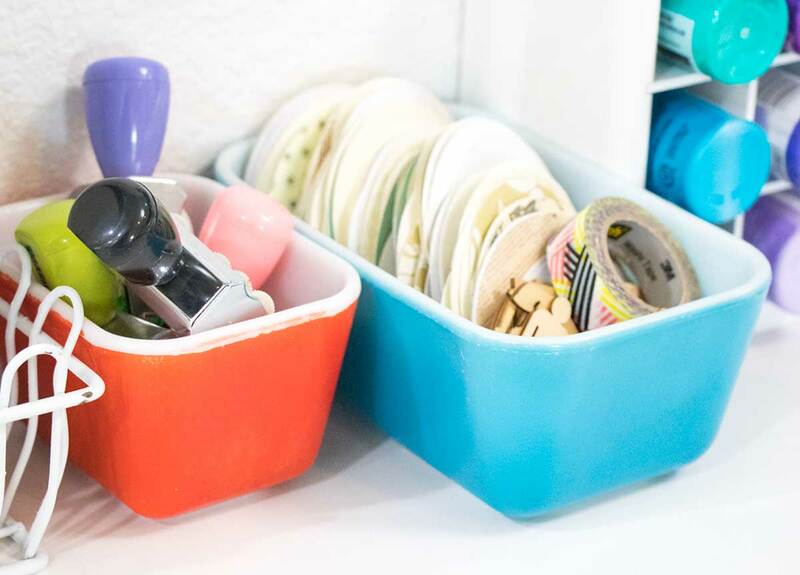 Okay, now let's get started with these small craft room organizing tips! A craft space doesn't have to be big … remember, this space is for you and YOU ALONE! This is my new craft space. Small, right?! Okay, honestly, I have a whole room and office and studio of craft supplies. Crafting is essentially my job. But in that “job” I lost my mojo. I didn't have a space to just piddle around with projects and play. I didn't have a space where I could just work on a scrapbook page for 3 weeks, leaving it out as I worked on it little by little each day. This small craft space is my answer to my crafting challenges … I needed a space to just PLAY. And that's 100% what this little spot is about. It's not about work.It's not about impressing anyone. This small craft space is all about inspiration. It's a place for me to get creative without any expectations or boundaries or rules. And that's how I approached decorating it too. It might look unfinished to some people. That's okay – I like it being more likea blank canvas right now. I am sure that over time I will fill the wall and the shelves and table top with stuff. But for now, I am loving the “blank canvas” feel of this small craft craft space. 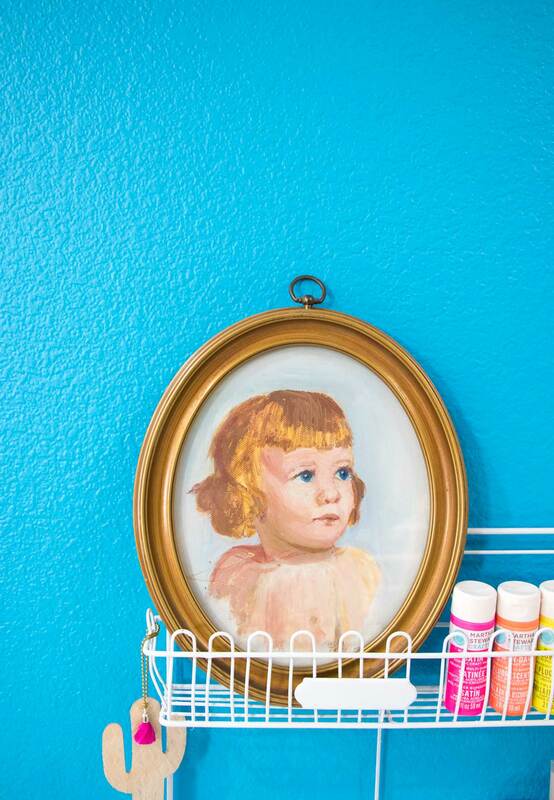 Why cant you have a painting your grandma painted in your craft space? Who says it all has to match? The key to make a craft space you love, no matter the size of your space, is to make it be a place of inspiration. I have this one wall to decorate for the small craft space and even though it is tall, I didn't want to do anything floor to ceiling in it. I chose a few special items, like my grandma's old pin cushions and an oil painting she did of my mom as a baby to decorate the space. I also used newer items with clean lines, like the Art bin paint and thread storage and the white wire rack the oil painting sits atop. I picked up these super cute vintage Pyrex baking dishes in Toronto last summer at an antiques mall. I loved the colors, the shape, and the size of them. And they're perfect for corralling stamps and ephemera that I want to use more often when I craft. It's YOUR space! Fill your small craft space with things that have meaning to you and that will spark love, creativity, and emotion in you. This place needs to be inviting and have meaning to you. You're gonna be spending lots of hours in here … make it yours! LESSON: mix old items and even family heirlooms with modern, new decor. Gather things that inspire you and put them together … inspiration is the common thread. Rules need not apply! If you find something that you love the shape of , it's super simple to change the color with simple spray paint. Have you ever watched one of those house hunter type shows on TV and you see people who decide not to buy a house because of the colors that it's painted? Well that's just silly! It's super duper easy to change the color of something with paint. When you're looking at to bring into your craft space don't look at the color at all; always look at the shape and the functionality. It's really quick fix to take a little bit of spray paint to something that you love to make it match your decor. I absolutely love the shape of this wire shelf that I got but it was a really ugly avocado green. I ended up spray painting it copper. Then decided I didn't like that color so now I've spray painted it white. Easy peasy fix! 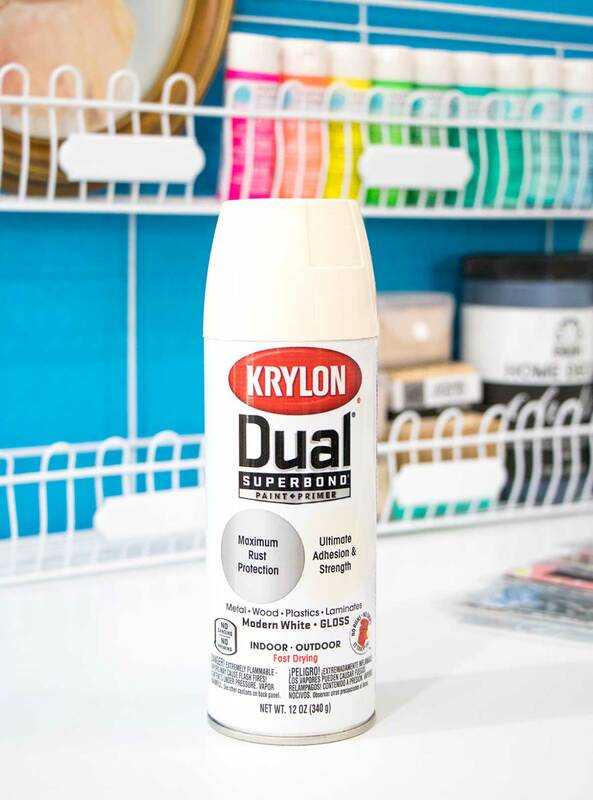 My go-to spray paint right now is this Krylon Dual Superbond indoor/outdoor spray paint with paint + primer in one application. One coat and you're done! LESSON: love the shape and hate the color can be come love the shape and love the color with a little spray paint action. Craft supplies are some of the most colorful things out there! 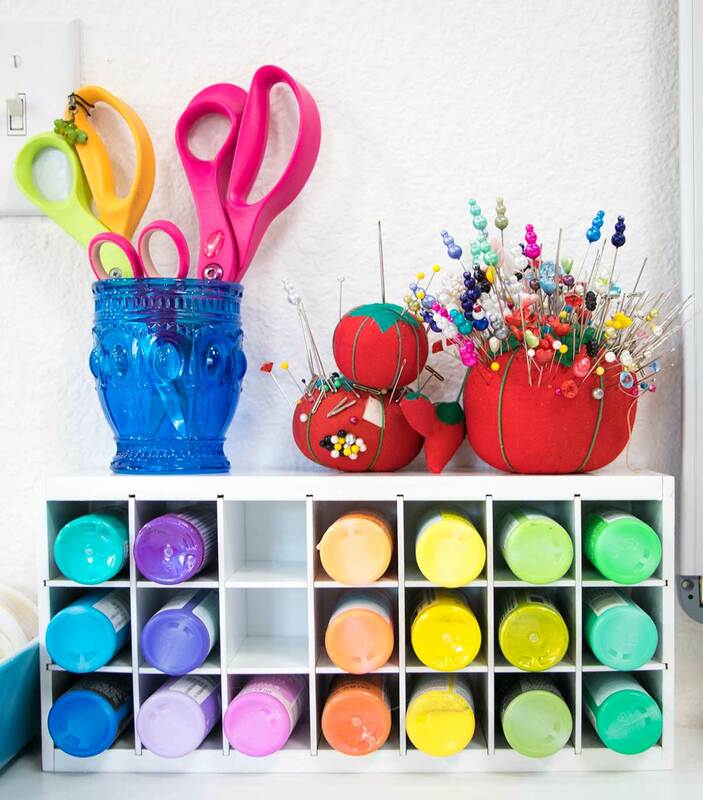 Why not use the colorful supplies we love as small craft space decor at the same time we store them? LESSON: craft supplies are beautiful. 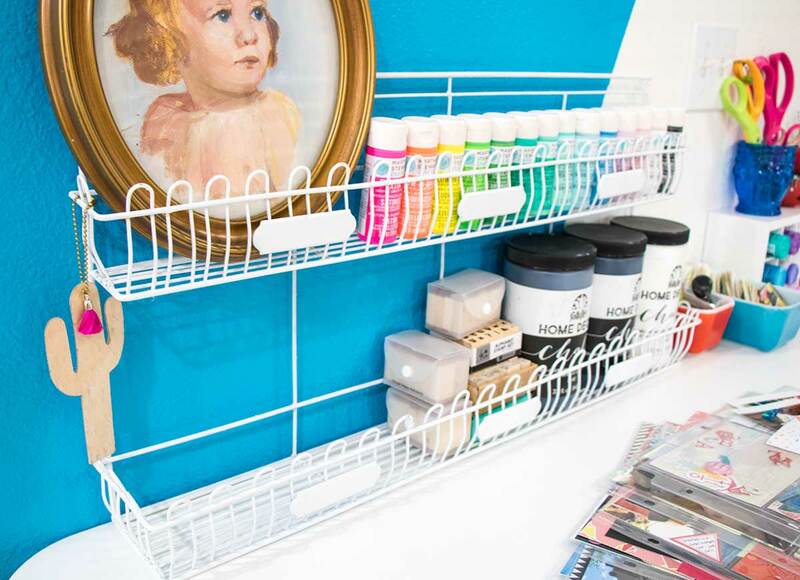 Collect your faves in your favorite colors and use them as decor in your small craft space. My all-time favorite place to score craft room furniture is the Ikea As-Is section. Someone told me the other day they didn't even know this existed. Another great place to get craft room furniture is the thrift shop. Again, look at the shape and the functionality first because you can always change the color or finish with some paint or stain. 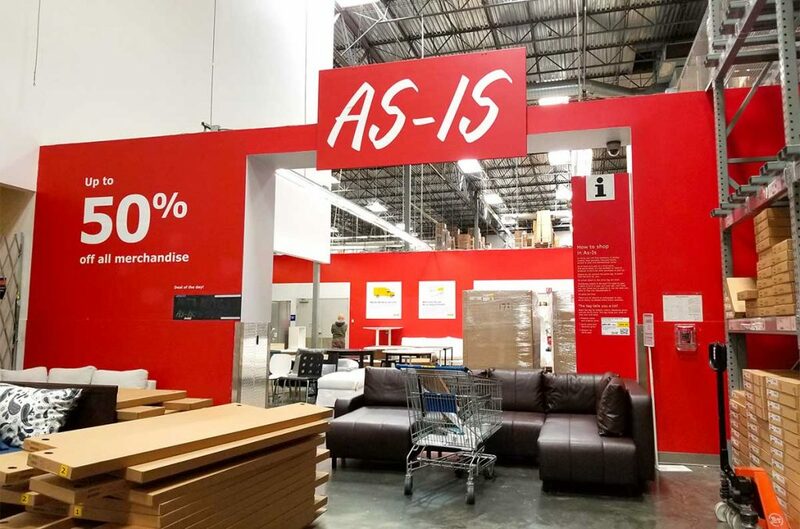 The clearance aisle at most any store is another fave for great craft room furniture deals. 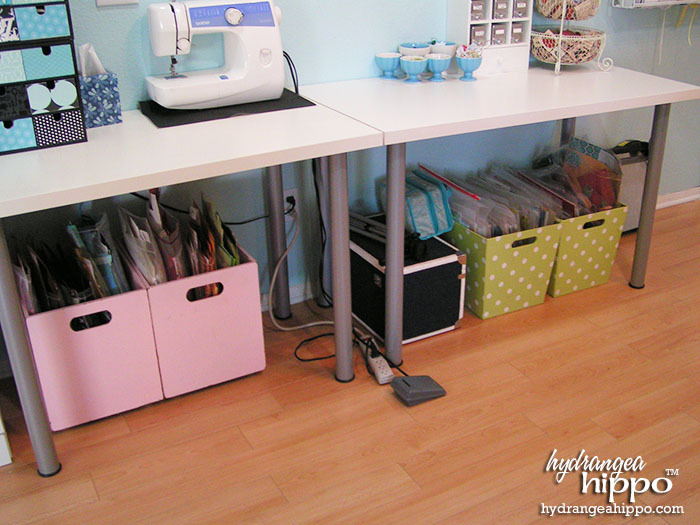 I got some rolling crates from Target on clearance that I used for years to hold scrapbooking kits as shown in this photo from my scrap room, circa 2010. That space is now my office. I got rid of these in a yard sale last fall and I kind of miss them. But I really love this small craft space and how streamlined it is now. You can also find furniture for FREE on sites like Freecycle and from Facebook Groups (sometimes you gotta buy the stuff in the groups). LESSON: make your small craft space YOURS with affordable furniture from mark-downs or thrift shops. Use paint to customize cheap furniture into custom furniture you love. 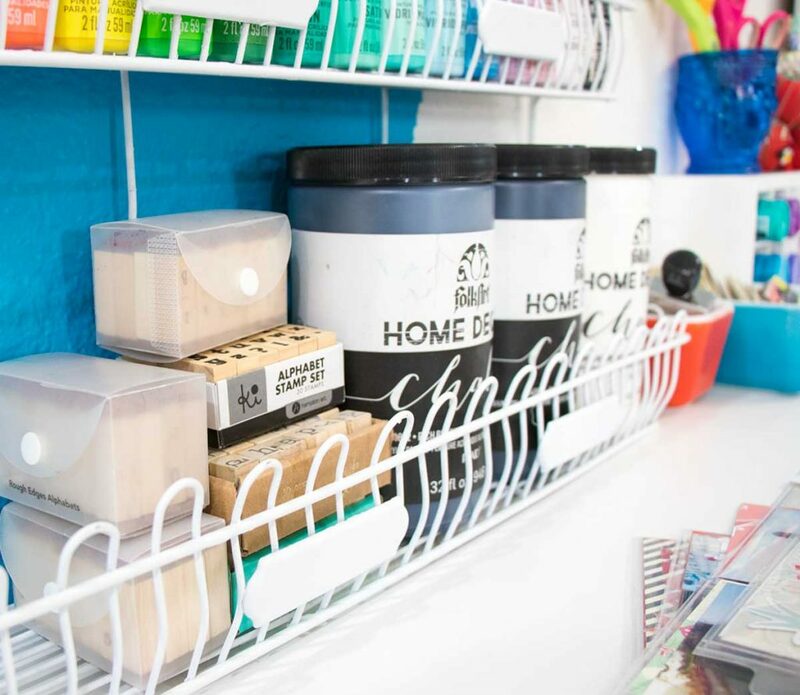 I hope you've enjoyed these tips about how to make a small craft space YOURS! Today I've teamed up with the bloggers from the Thrifty Style Team to bring your thrift shop and upcycled decor ideas! So many great tips and your craft room looks amazing, Jennifer! Your grandma looks like me as a baby, omg! Almost identical, not kidding. Love your craft space. So cool!! 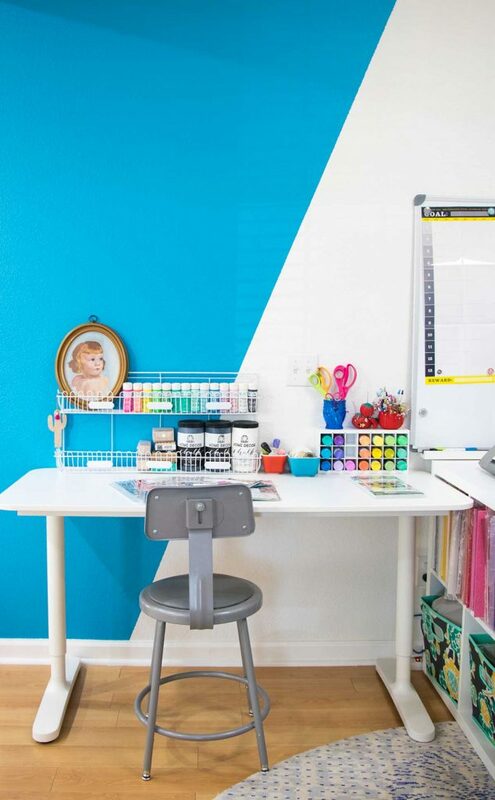 Wow your craft room is totally amazing! I am working on making over my craft room and this gives me a ton of ideas! Your craft space is amazing!! So many great tips too! 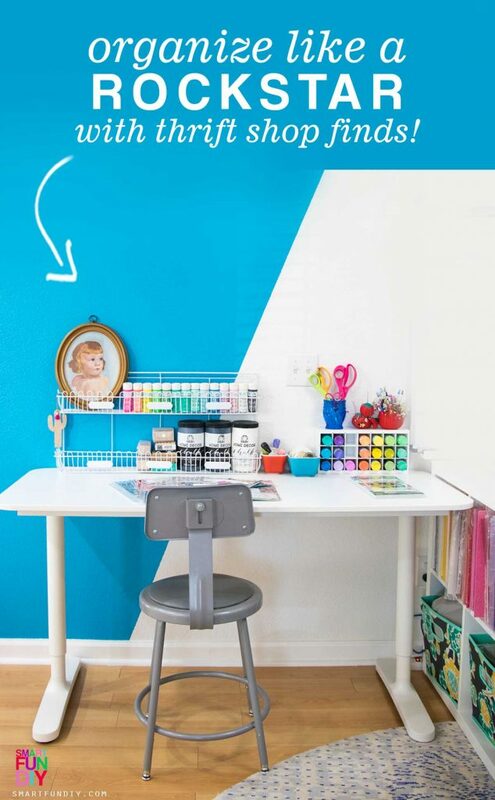 What a great space to make and create in…love how colorful and fun it is! Thanks for sharing, Jennifer! Thanks for sharing, Jennifer. I really need some of these tips. AND, it always a treat to visit your blog. Have a wonderful week. Jennifer, I would give almost anything to have the space that you have for crafting! It’s so nice and bright and seems like an ideal place to let your imagination go. Currently, my crafting space in my dining room! I enjoyed reading all of your tips just in case we ever reconfigure how we’re using some of our rooms! 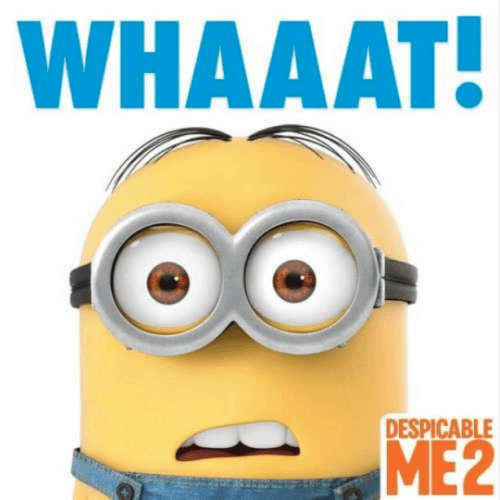 I can say this with 100% certainty…. my guest bathroom closet is not working for me to store my craft supplies! I do have a spare room, but it gets over whelming thinking about organizing it. You always have awesome ideas, Jennifer. Thanks for sharing your awesome space with us. You are amazing. Thanks for the motivation. I am a newbie to your site and I am in love. Awww thank you so much 🙂 Glad you are here!!! Wonderful space to let your image and passion for creating go….and go. I loved your website and can’t wait to get the notebook. My Office/Craft/Sewing Room looks like a cyclone hit. I don’t really know where to begin. I’m sure that I need to get rid of ‘old’ paint that is probably not any good from sitting in the closet. Oh well, I’m going to get this space organized and suitable so that i can put everything I have to good use and really do what i love CRAFT, SEW, etc. !